I understand your plight completely. 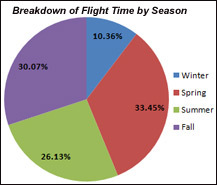 While I haven't added up my hours to correlate them with the seasons, I definitely have flown less this winter. As in once in the past 90 days. Between the holidays, work, limited sunlight, and weather it's sure hard to get up with any regularity this time of year. It's great that you're back up and flying Todd. Looking forward to more of your educating posts and photos. Nice information provided here through graph.